Who doesn’t love the creamy, rich melt-in-your-mouth taste of chocolate? Whether you like your version plain, dipped, sprinkled, filled, dark, milky, or white, you’ll find what you want at any of the 10 best chocolate shops in West Virginia. Here are our favorites! If the delicious smell doesn’t sell you when you walk through the door, the sight of beautifully decorated and colorful chocolate candies of every size and shape will. Shopping a De Fluri’s Fine Chocolates in Martinsburg is definitely a step into indulgence, but so worth it. 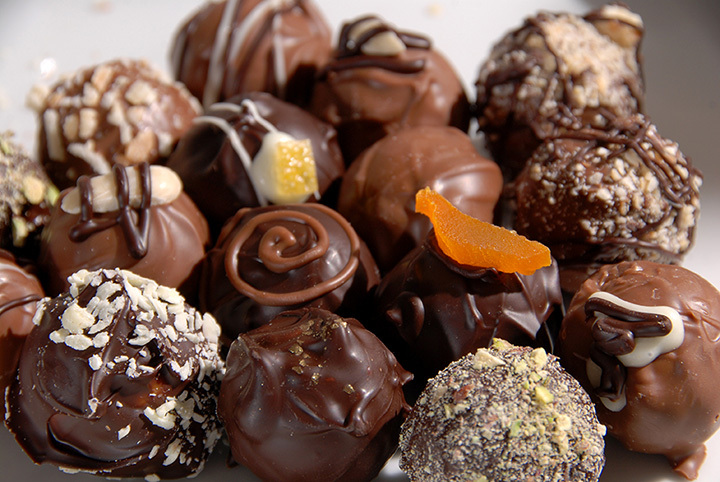 From truffles to mints and caramels to creamy centers, the only problem you’ll have is which ones to take home. The only thing better than great chocolate candy is great chocolate candy with a 100 percent guarantee. You can pick an assembled box of candy or build your own box from the assortment of nuts and caramels, truffle flavors, milk or dark chocolates, or sugar-free confections. It’s all good. Ever wonder what kind of candy people ate during the early part of our country’s history? You can find out at True Treats Historic Candy in Harpers Ferry. It’s worth going for the great choices of your favorite chocolates and other candies, but it’s the most delicious history lesson you’ll ever have. Check out Wilbur Buds, the original chocolate kiss candy. Seeking something sweet? Check out Smith Candies in St. Mary’s for hand-crafted candy treats including rock candy, caramel corn, cotton candy, and the ever-popular chocolates. If you love chocolate, you’re going to enjoy the dipped fruit, pretzels, and apples, but the individually-wrapped chocolates taste as good as they look. SweetDreams Chocolate, Inc. is no ordinary candy store. This is a place where your dreams really can come true. Besides some of the creamiest chocolates around, you can order specialty cakes and cupcakes made with the same quality ingredients and care as all the chocolates. If chocolate is what you crave, you have to make a point of visiting Slight Indulgence in Morgantown, West Virginia. This shop’s specialty includes chocolate in every shape and form, including hot chocolate, domestic and imported chocolate, and wine that goes with chocolate. With the great bulk prices at Candy Craze in Barboursville, you can buy for yourself, your friends, your family…even complete strangers! They have treats for yourself, gifts for others, and even ideas about how to sponsor an event that features your favorite candy. From five-pound gummy bears to giant bags of chocolates, you can also shop at their store in Charleston. Chocolate Moose in Beckley, West Virginia has been one of the state’s best kept secrets, but no more. With an awesome selection of great roasted coffees, creamy hand-scooped Hershey’s ice creams and chocolate syrups, there’s always something to celebrate. And before or after you enjoy your coffee or chocolate treat, you can have fun in the climbing gym, Outside-In, or play a round of miniature golf. In the world of great snacks, chocolate has to be at the top of the list, and there’s no better place to satisfy your chocolate snack craving than Snack Dragon in Moundsville. It’s the only place where you can get a heart-shaped box of assorted chocolates AND eat the box! They also have Good News candy bars that can be customized with your good news for any event. When you need your snack satisfied, check out the Snack Dragon.